State policymakers involved in drafting state budgets will face increasing difficulties in coming years as the rising cost of spending obligations such as schools, health care, and pension funds strains states’ ability to pay for them. At the same time, federal support for state programs will continue to shrink as the federal government is forced to grapple with its own fiscal problems. States will need to either reform their budgets or raise taxes as a proportion of income. This decision could be game-changing both for state budgets and for federalism more broadly. Economist Michael D. Thomas focuses on trends in the state of Nebraska, which faces a looming fiscal problem. The expansion in the scope of tasks the state now manages, not just in terms of federal programs but also in terms of funding local programs, has resulted in spending mismatches with local priorities and a state government that is squeezed between the federal and local governments. The way forward is to set realistic priorities for spending at the state level. Nebraska has long benefited from a relatively good fiscal position, and is therefore in a better position to manage this task than other states. The budgetary squeeze refers to a phenomenon of budgetary pressures that is affecting every state, including Nebraska. As program costs rise, Nebraska is increasingly budgeting for the short term. With a state government squeezed between budgetary obligations to both federal and local programs, political rhetoric shrinks to a choice to cut spending or increase taxes. The squeeze comes from two sides: local to state and federal to state. Since Nebraska attained statehood, it has placed a strong constraint on revenue (and therefore on spending as well). Limited to funding by a state property tax for decades, Nebraska policy making was constrained, such that the state could not deliver all the services voters wanted. In the 1960s, Omaha’s public schools were in crisis. As urban flight worsened economic segregation, the state and federal governments’ aid fell short of what was needed. Omaha’s school district then annexed surrounding school districts in order to help make up the funding difference. In 1967–1968, Nebraska introduced an income tax and a state sales tax, and these measures led to increased tax collections over time. Meaningful reform had to avoid setting policy through piecemeal reactions to short-run events, and instead take a longer-term, big-picture view while formulating policy. The US government has benefited for some time from very low interest rates on sovereign debt, allowing it to spend much more freely than it would if it were paying a higher rate to borrow funds that will obligate future taxpayers. At various times states have been skeptical about the likelihood that the federal government will continue to fund mandates into the future. Nebraska fears increasing its dependence on funds from the federal government. Nebraska is a net recipient of federal tax dollars, according to a Tax Foundation report covering 1981–2005. The $1.10 received per $1 spent places Nebraska squarely in the middle of the pack of states receiving tax transfers from other states. This is a good position to be in at the moment, but as the federal budget position weakens owing to increased entitlement spending on programs such as Social Security, Medicare, and Medicaid, the pressure on states to fund greater portions of these programs increases. Nebraska has many options for reform. The “dynamic” approach to the fiscal commons, that is, the common pool of fiscal resources, points out that all the pathologies in policy were arrived at one step at a time and therefore can be corrected one step at a time. School choice is a great opportunity to get more out of every dollar spent on education. 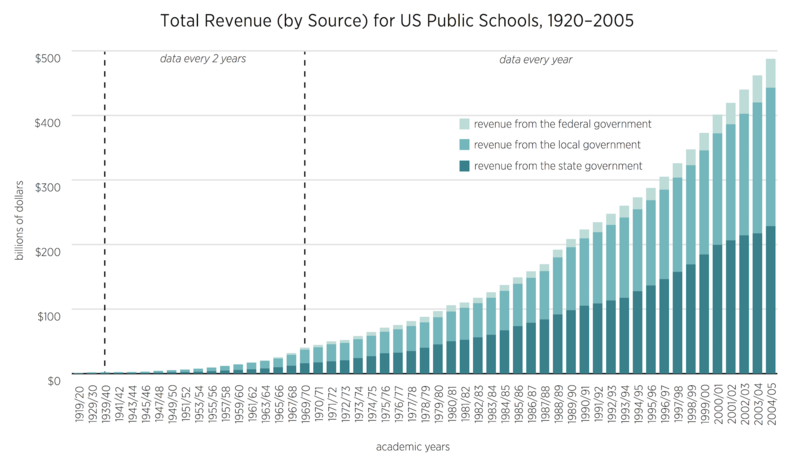 Moving away from thinking of schools as geographic monopolies can help solve this school funding problem. Regarding pensions, tensions remain after a major pension reform in 2015 because current public-sector workers feel they are owed defined benefits on terms originally promised. It can reduce the tax rates on property so the extra revenue, currently returned through a tax rebate, is not collected in the first place. It can create a clearer distinction between state and local spending so that each government entity can set its own priorities. If states like Nebraska continue to manage local issues and finance them out of the state budget, it is more likely that the states will finance expenditures that are lower priorities for voters than what voters might accept if each local government financed a larger share of its expenditures from local taxes. Weathering the Next Recession: How Prepared Is Nebraska?